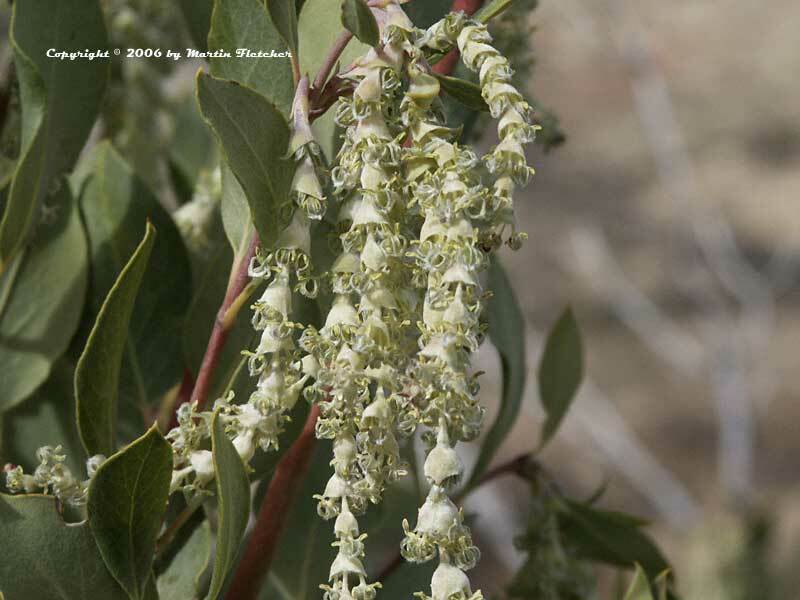 I have seen Garrya elliptica growing on North facing slopes and in shady locations and at times also on full sun exposed shale ridgelines of the coast ranges up to 7000 feet, sometimes on inhospitable looking soils. The dark green glossy leaves are set off nicely by the creamy white tassels of flowers. The Coast Silk Tassel is becoming a popular cut flower. Garrya elliptica gets to 10 feet tall in the wild and tends to be taller than wide. The cultivar that I see most often in the trade is Garrya elliptica James Roof. Garrya elliptica has survived local temperatures in the single digits. Garrya elliptica probably dies more often from too much water rather than too little. Green tinted - white strings of flowers of Garrya elliptica James Roof - Coast Silk Tassel. High resolution photos are part of our garden image collection.